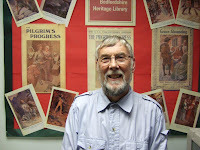 Barry Stephenson, a former BHRS Council member, and Local Studies Librarian at Bedford Central Library for over 25 years, retired on 16 August 2012 after working for 50 years for Bedfordshire Libraries. Bedford born and bred, he started at as a trainee librarian with Bedfordshire County Council on 10 September 1962, working at the old County Library, the former Town and County Club building on the Embankment in Bedford (now the site of the Swan Hotel car park entrance). He was then sent on a two year course at Loughborough to gain his professional librarianship qualification before embarking on a career which took him to several posts and locations in the county. The first professional post was at the old Dunstable Library in 1966 as Readers' Advisor, but within 12 months there was a move to the new, present Dunstable Library. In 1970 he moved to the County Library in the Riverside Building at County Hall [now Borough Hall] as Assistant Reference Librarian and he became Local Studies Librarian in 1974. He had meanwhile become one of the first part-time students of the new Open University and had gained his BA in History in four years. When the County Hall Library closed in 1986 he moved to Bedford Central Library and served there until his retirement, albeit becoming part-time from 2008 when he reached pensionable age. His proudest moment was in May 2000 when the Bedfordshire Heritage Library was opened within Bedford Central Library which allowed much historical material, previously in closed access, to become available to the public. One of Barry’s greatest achievements was in the creation, over three decades, of the extensive newspaper cuttings collection which has enabled countless thousands of readers to answer their queries regarding local history. When the Virtual Library came along he was able to enormously extend access to enquirers from around the world. 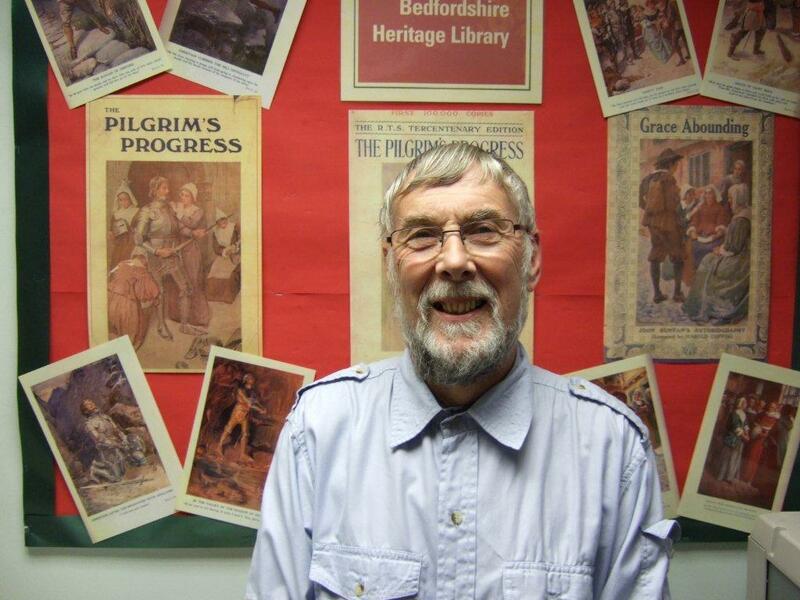 Over many years he created online chronologies for Bedfordshire’s villages and towns, based on the incomparable collection of local histories he had helped to build up in the Local Studies section of Bedford Central Library. A quiet and unassuming man, he is known for the diligence with which he answered the many postal (and, later, online) enquiries from around the country and abroad, as well as the face-to-face assistance to both local and family history researchers, and to international scholars who came to consult the famous Bunyan Collection. As a native Bedfordian, he loved researching Bedfordshire’s past. Outside work, his abiding passion has been for Bedford Town Football Club which he has supported all his life. He served as Secretary from 1989-2002 and from 2002 as Company Secretary, a post he still holds. He writes a Memory Lane page for all ‘home’ programmes, so still visits his former library to do his research in local newspapers. His other interests are gardening and attending tea dances.